I love beards. I love facial hair of all sorts on men. It's a Sikh thing, of course. It's also a masculinity thing. To me there is nothing more attractively masculine than a nice, full beard. I have been told that I must have something wrong with me, that there is something wrong with my love of hyper-masculinity. This is not to be confused with machismo, which is aggressive and tends toward violence. I don't think so. Beards are attractive! This brother has a truly extraordinary beard - and it's still growing. A Surrey teacher's fantastic facial hair may soon earn him a world record for the longest beard. Measuring about two metres in length, Sarwan Singh's face coat would trip him up if he didn't keep it under wraps or throw it over his shoulder, says Dr. Pargat Bhurji, also a bearded Sikh and an organizer of an event tomorrow night in Surrey to try to find a record-setting man veil. 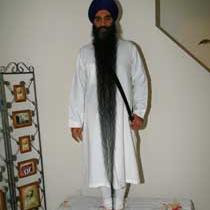 The record is now held by Shamsher Singh of India with a beard last measured at 1.83 metres. 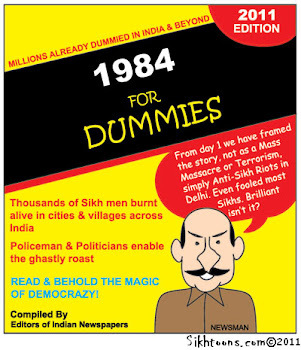 But, says Bhurji, "[Singh's] beard is still growing" and, at age 42, he has lots of time left. Friend Avtar Gill says Singh will be tough to beat, but it was also a challenge to convince the devout Akal Academy teacher and father of two to put his beard forward for the hirsute honour. Singh wraps his beard and conceals it from view at the Sikh school, said Gill, concerned that he would be seen as improperly flaunting what Sikhs believe is part of the human body and therefore sacred. "[The beard] is gifted by God. It's not his own creation," said Gill. Singh himself told The Province yesterday that he considers the beard "more important to me than any other body part" and would sooner lose his head than shave it off. Bhurji described Singh as a "very humble and pious man" who is respected worldwide as one of the very few learned Sikhs permitted to sing in the Golden Temple. Between 150 and 200 people are expected to show up for the beard-off and the event is open to all who wish to put their Grizzly Adams jaw shrubs up for consideration. "There may be someone else with a longer beard [than Singh's], but we don't know," Bhurji said. Anyone who wants to show off their full beards, goatees, chin strips, soul patches, chin curtains or mutton chops can do so starting at 5 p.m. at the Akal Academy, 204-12639 80th Ave. in Surrey. 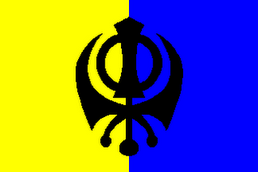 The importance of hair to the Sikh religion will also be discussed. The world record for the longest beard ever belongs to Hans Langseth of Norway, who died with Rapunzel-esque jaw rope measuring about 5.4 metres. 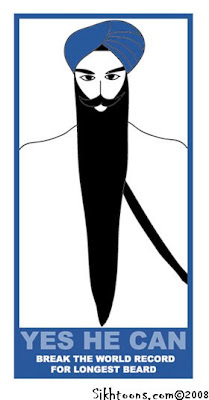 The longest beard on a woman was a 36-centimetre shoulder tickler belonging to circus "bearded lady" Janice Deveree, who set the record in 1884. I wondered the same thing. It's hard to tell. Mani's beard was midchest, and his hair were a length to sit on. (We never actually measured either. My Dad was about the same. On the other hand, my chinhairs, the few I have are about 4 cm, while my head hair, at their longest, when I was young and healthy, were a bit past my knees. Being of Scottish/Belgian descent, the men in my family have always been rather hairy. The previous generations all had long beards and/or impressive moustaches.